Franko B "I Miss You"
When it comes to weird stuff, performance art really is the gift that keeps on giving. Case in point, I recently came across this 2000 piece by artist Franko B titled "I miss you." Here's a quick synopsis of the work. The audience surrounds a long catwalk which is covered in canvas. Franko presents himself naked, painted white with an open catheter inserted in the crook of each arm. As blood pours out of the catheters, dripping onto the floor, he walks up and down the runway while Diamanda Galas's 'My world is empty without you' plays in the background. As to be expected, reactions to the performance run the gamut from "self-harm is not art" to "he's personifying art." But this isn't the first time Franko B has done this sort of thing. 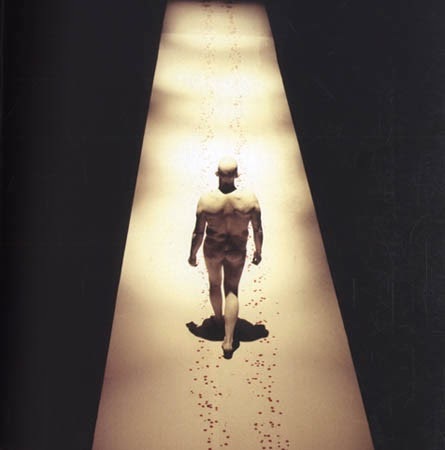 In 1996 he performed "I'm not your babe" where he again paints himself white, catheters in arms, bleeding on the floor. He does this for about 10 minutes, then falls to his knees for a couple of minutes, then finally lays on the ground for bit. Franko B "I'm not your babe"
And then there is his 2001 performance of "Oh Lover Boy" where he paints himself white, inserts catheters into his arms and lays down to bleed all over a canvas covered table. Franko B "Oh Lover Boy"
Here is a collection of a number of Franko B's performances including the ones above. Fair warning, the video does not allow you to fast forward so to get to the later performances, you would have to be very patient and very interested, neither of which I was. Franko B performance from Tim Ashton on Vimeo. There was no diamanda galas soundtrack on Franko b's I Miss You. Whoever made that YouTube video added it, but it has nothing to do with the performance, which was silent except for the sound of the audience and photographers.